​Mrs. Hope Dyea is from the Village of Paguate though she was born and raised in Albuquerque, NM. Her parents are Russell and Gloria Martin. 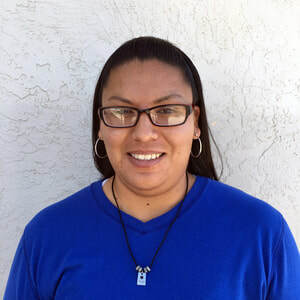 She graduated from West Mesa High School in 1998 where she lettered in Business Professionals of America for two years and was recognized in “Who’s Who Among American High School Students” her Senior year. She married her wonderful husband Patrick Dyea, Sr. in 2005 and they have four sons, Julian, Patrick Jr., Julius and Adrian, who all attend St. Joseph School. Hope is a full time Volunteer at our school and works primarily in St. Julie AR Library. She firmly believes the transition of sending all of her Sons to St. Joseph Mission School was the best decision they have made. The very happy environment, morning prayer to set the focus for each day and the highly respectful Staff and student body are all decisive factors for sending her children to school here.